Access forums to find answers to your questions, make product suggestions and get in on discussions with other members. Go to https://www.genuitec.com/forums/. A list of product forums displays. Select the product and then a list of forums for the selected product displays. 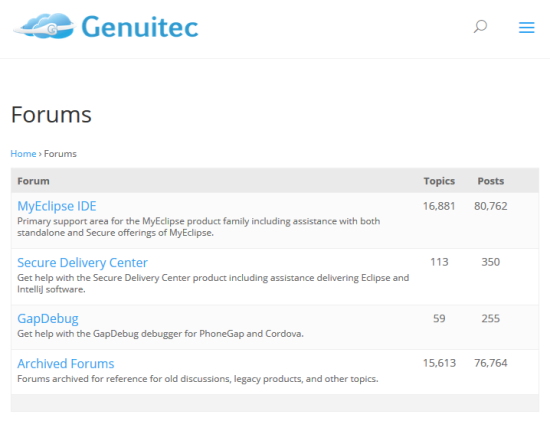 Select the appropriate forum to view a list of topics. Select a topic from the list to view all posts associated with that topic. Tip: Scroll to the bottom of the page to reply to the post. Although anyone can access our forums, you must create an account to post to the forum. Go to https://www.genuitec.com/forums/ and then select Register. Complete the fields and click Complete Sign Up. You will receive an email to activate your account. 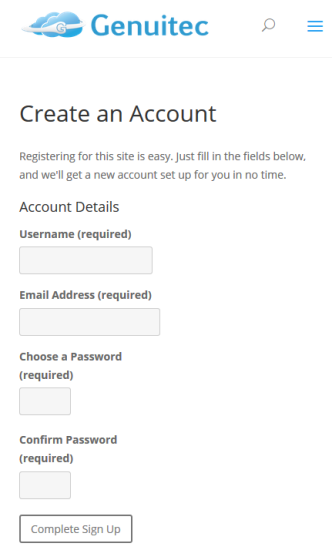 Once activated, click Log In and enter your username and password. Before creating a new topic, you can search to see if the topic already exists. 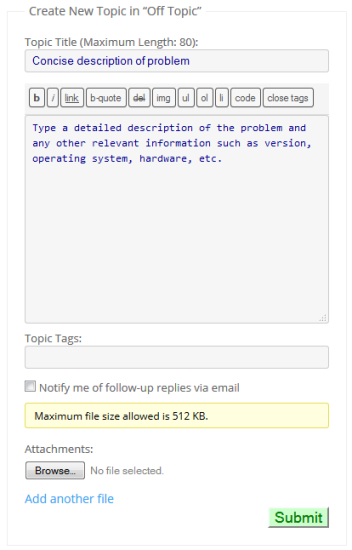 Type your topic description in the Search Forums box. If you don’t see your topic after doing a search, you can always start a new topic. Navigate to the appropriate product forum. Scroll to the bottom of the page to access the Create New Topic section. Enter a descriptive title and the question. You also have the option to include tags, select email notification and attach files. Tip: To view topics you have added, go to MyProfile>Forums>Topics Started. You can mark a topic as a favorite to quickly locate it in the future. To designate the topic as a favorite, click Favorite while viewing the topic. To view a list of favorite topics, go to MyProfile>Forums>Favorites. To remove a topic from the Favorites list, click Favorited while viewing the topic. You can subscribe to a topic to receive an email notification when the topic has been updated. To subscribe to a topic, click Subscribe while viewing topic. Tip: You can also subscribe to an entire group of topics by clicking Subscribe while the list of topics is displayed. To view your subscription list, go to MyProfile>Forums>Subscriptions. To remove a topic from the subscriptions list, click Unsubscribe while viewing the topic.